The LORD appeared to us in the past,[a] saying: “I have loved you with an everlasting love; I have drawn you with unfailing kindness. Whew, this has been one wild ride of a week! In case you haven’t noticed, I haven’t blogged since Tuesday night. Good intentions and all that – life came at me full force this week. My “Pray, Cook”, Blog” day is kind of a fantasy day. 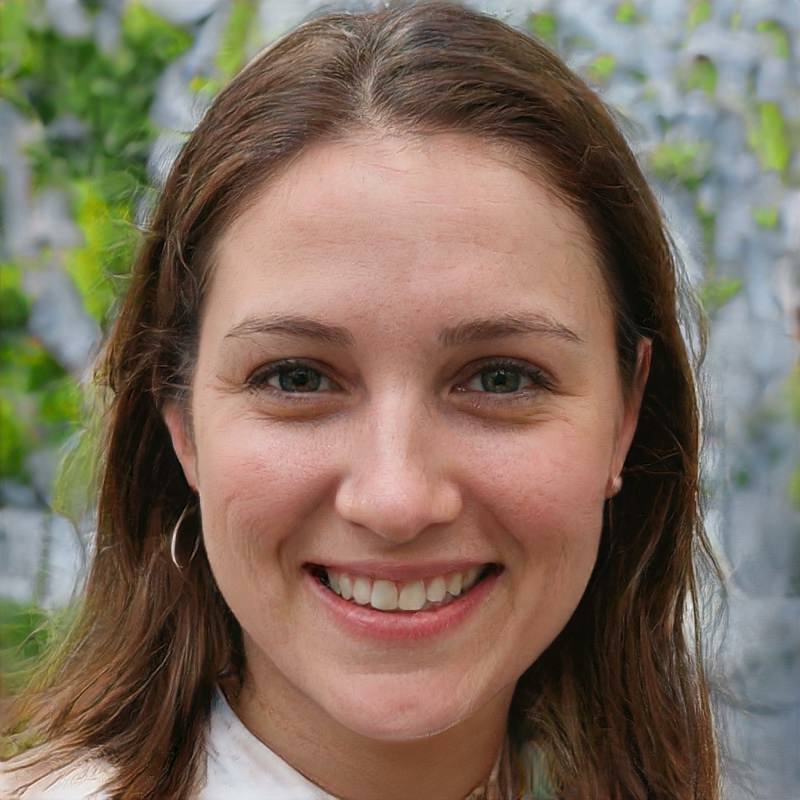 I have had a few of those where I spent the time praying, cooking, and blogging. But this past week has been no fantasy. I know you can relate. We all have days, weeks and sometimes months and years like that 🙂 The funny thing is, as I was painting in my bathroom yesterday afternoon, all I wanted to do was hurry and get done so I would have time to blog before bed. Yikes – am I addicted to this little time of sharing? Maybe. Painting. To my brother John, and sister-in-law, Jeanne – “I feel your pain.” John and Jeanne set off this summer for a quick and easy shower re-do and ended up with a full brand new bathroom. One little problem led to another, then some mold got involved, and before you know it they were weeks into a remodel project. However, I am so thankful they took time to come visit us this summer before the shower got done and everybody had to head back to school! I previously bragged, I mean blogged about a good deal we got on a jacuzzi bathtub. Since we only have showers in our house, a bathtub sounds soooo good. Two weeks later and 14 times the savings on the bathtub ($), the tub is in and I am painting in our newly remodeled bathroom. It seemed so easy in the beginning … take out the old shower, pop in the tub, put some tile around it, repair a little wallpaper that had to come out with one little wall – and soak in that new tub! We wanted to save the old shower stall to use in a cabin we are going to remodel someday, for a guest room. No problem – until it was too big by 1/2″ to get through the door way and out of the house. Then, it was time to install the tub only to find a broken pipe, hidden nicely up and under the back. (Can you say “sale price”). A quick trip 95 miles away to pick up another tub, seems to be the closest one to us on that particular day, and we are back in business. Time to repair the wall paper – but hey, why repair wall paper when this is a great opportunity to take off the wall paper and get a whole new look with PAINT! No problem, just a little wallpaper to strip. I got most of that done one evening before the contractors were back the next morning. However, I left one little area that I didn’t get done. Turns out, that is the one little area where the contractor needed to add new sheet rock, tape and some mud. No problem, I can do it when they are done. It’s Friday, the tub is in, the tile looks great — paint a little and call this remodel DONE! Oh yes, I had that one little area to finish stripping the wallpaper. I sprayed a little water, I took my scraper and scraped that little bit and before I knew it I pulled a whole strip of recently mudded sheet rock tape clean off the wall! I was so stunned and still am. If only I could take back that 5 seconds in time. Yep, I pulled that stuff right off the nicely mudded and sanded area and stood there trying to decide if I should cry, scream, or call the contractor. I called the contractor. Contractor will be back Monday, I won’t finish this project until … well, later. Guess I better cook something. 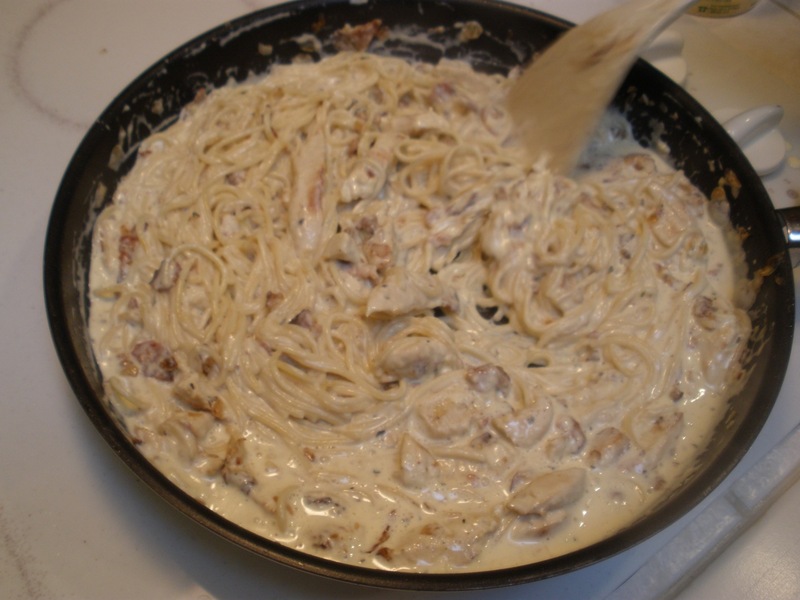 Gladly changing the subject … I love Chicken Carbonara. Sometimes I can get it at nice Italian restaurants. But I like it best when I fix it at home. 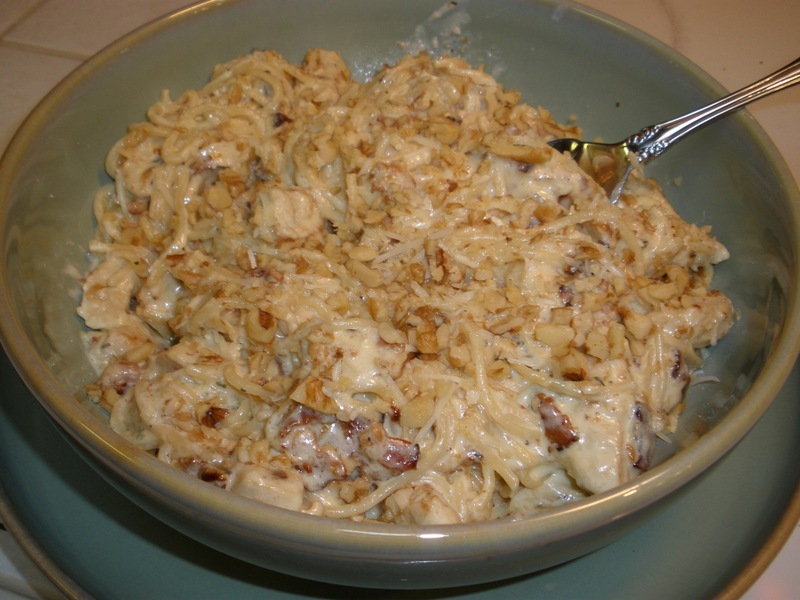 If you like pasta chicken dishes this one just might become a family favorite. I will tell you though, the pictures don’t do it justice. Cook spaghetti in boiling water for 10 minutes. Drain well. golden. Drain off some of the drippings; add butter and garlic, and onions. In a large bowl, whisk together the cream, cheese, basil, parsley, and egg yokes to blend. 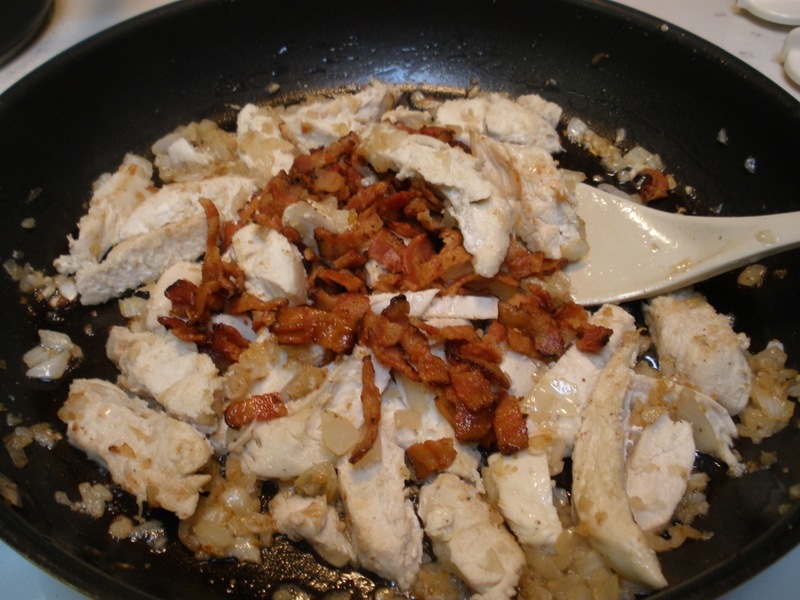 Add the cooked spaghetti and the chunked or shredded chicken to the bacon mixture and stir to combine. 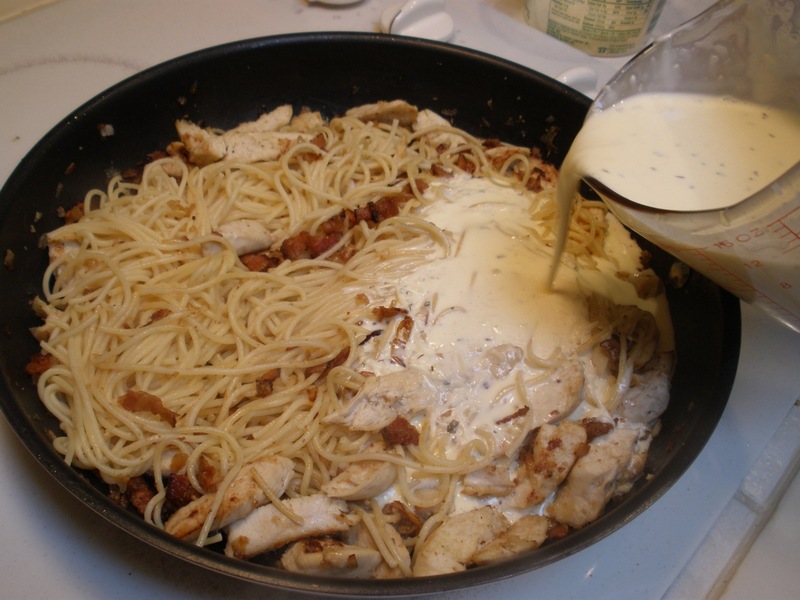 Slowly pour the cream mixture over the chicken/spaghetti mixture and toss over medium-low heat until the chicken is heated through and the sauce coats the spaghetti thickly, about 4 minutes. DO NOT BOIL or you may end up with scrambled eggs! will provide some saltiness so you may only need to add some pepper. Transfer the pasta to a large wide serving bowl. 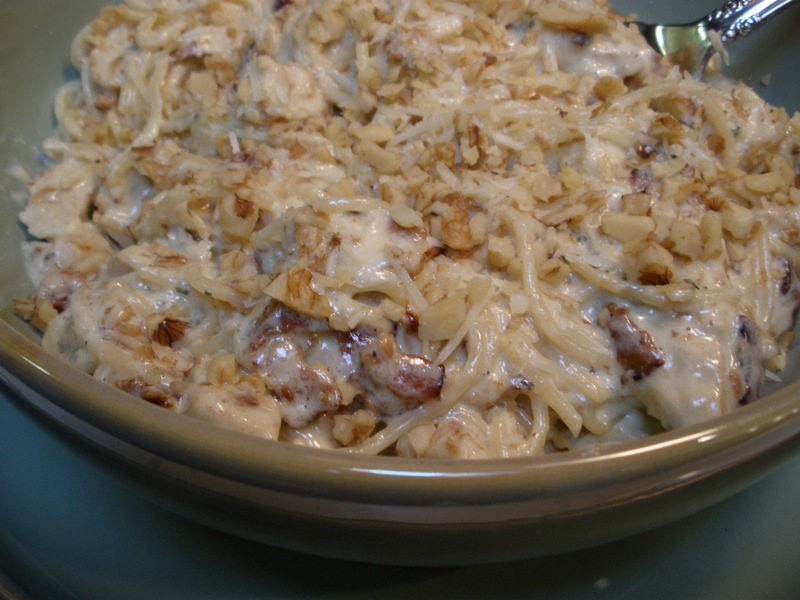 Sprinkle with chopped walnuts and serve immediately. I left the butter out of the ingredient list first time around! Calls for 2 Tablespoons — definitely better with butter! I’ll have to try this recipe. My Carbonara does not have cream in it, the sauce is mostly eggs and Parmesan cheese. A little creamier sounds like a nice change. I haven’t made past in so long, it’s so hot this summer it just seemed ‘heavy’ I guess. But Brian has been bugging me for some, it’s his favorite food. Thanks for the recipe! Here is what wikipedia has to say about Carbonara: Pasta alla carbonara (usually spaghetti, but also fettuccine, rigatoni, or bucatini) is an Italian pasta dish based on eggs, cheese (pecorino or parmesan) bacon (guanciale or pancetta), and black pepper. The dish was created in the middle of the 20th century. Cream is not common in Italian recipes, but is used in the United States, France, Spain, the United Kingdom, Australia, Russia (especially in Moscow) and Japan. Other Anglo/Franco variations on carbonara may include peas, broccoli or other vegetables added for color. Yet another American version includes mushrooms. Many of these preparations have more sauce than the Italian versions. My guess you are making a more authentic version than mine. But I will tell you — the cream makes this outstanding! I know that fall is coming because I made pot roast a couple weeks ago and pasta this week. I agree, it is so darn hot – but we were hungry for both! Hope all is well with you, Brian and your little ones!